Lora’s in the middle of a messy divorce with her bull rider ex-husband. Just because she left the WBR circuit and is making a name for herself as a trainer, now his buckle bunny of a girlfriend thinks she can take half of Lora’s farm, her two best horses, and even her truck and trailer in the divorce and do the same thing. 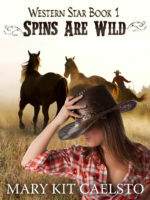 Lora’s tired of propping up Billy and it is long past time he learned to cowboy up and take responsibility for his own life. She’s swearing off men for good. Until her best friend introduces her to an up and coming D-series barrel racer with plans of his own.